• Brand: • Product Type: Pendant• SKU: 18016PADL400• Colour: White and Golden• Material: Alloy• Plating: Rhodium and Gold• Stone Used: Australian Diamond• Design: CAD/CAM• Dimension: Pendant: Length - 2.5cm Breadth - 1.5cm Weight - 12g• Description: The onset of February sees ‘love is in the air’ but finding your sweetheart the perfect gift and the anticipation of an utterly dreamy day has everyone starry-eyed. 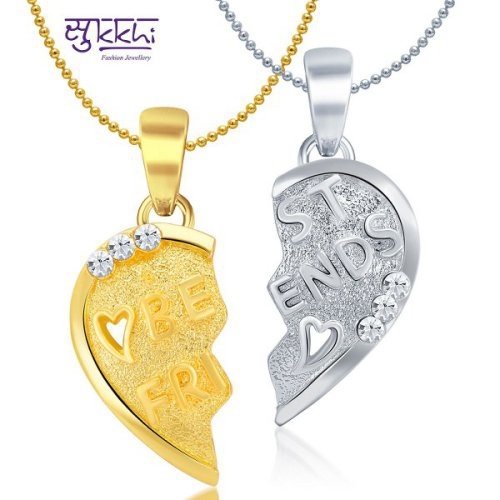 This Sukkhi BEST FRIENDS Gold and Rhodium Plated Lovely 2 in 1 Valentine Broken Heart Pendant with Chain made of alloy is the right gift – romantic, meaningful, pretty, and fitting within a budget for him/her.• Care label: Avoid of contact with water and organic chemicals i.e. perfume sprays. Avoid using velvet boxes, and pack them in airtight boxes. After use , wipe the jewellery with soft cotton cloth. • Note: The image has been enlarge for better viewing. • Disclaimer: Product colour may slightly very due to photographic lighting source or your monitor settings.